Celebrating over 60 years supplying quality writing instruments, Global Catalogue presents Derofe Fine Writing Instruments; Each Derofe ball point pen is fitted with an exceptional Swiss made ball point refill which will write for over 9000 metres. Given the superior life of this refill, each Derofe ball point pen will stand the test of time, and reflect the qulaity and integrity of your brand. 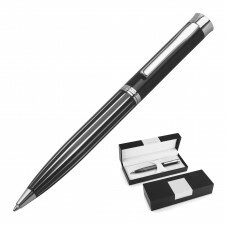 Each Derofe pen is fitted with a medium black bal point and an aditional medium ball point pen is included in the elegant gift box. Each Derofe roller ball pen is fitted with the superior Germa made Hauser "OPEN" black refill, with an additional black refill included in the elegant gift box. 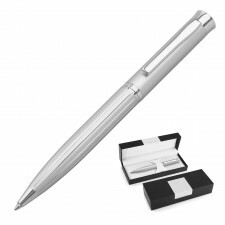 Hauser refills are renowned for their incredibly smooth delivery system that wil not scratch the page or dry out when the lid is left off. On requests, Derofe Fine Writing Instruments can also be packaged as sets including a ball point and roller ball. A Derofe Fine Writing Instrument will epitomise integrity, quality and durability. When permanently laser engraved, it becomes a personalised gift that can be appreciated for many years to come and is perfect for any occassion. All Derofe Fine Writing Instruments are covered by a two year mechanical deficiency warranty.